Get the scissors out and print out some of our cutting skills printables to use at Easter time - what a fun way to get some cutting practice! The children could use some of their cut-outs to make cards or pictures for Easter, too. Colour in the Easter baskets and then use our Easter basket decorations to add some glitz and glamour! 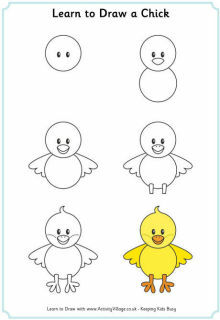 Colour in these pretty decorations, cut them out, and then use them to decorate our Easter basket printable. Cut out the little rectangles and stick them back onto the bigger Easter egg hunt picture, making sure they are in the right place. Now colour in if you like!